Lieu extraordinaire. Ceci est un condo avec un personnage. Luxe vous entoure que vous entrez dans ce lieu idéal pour trouver plaisir, d'excitation pour toute la famille. La station familiale par excellence sur la magnifique côte de Panama City Beach. En bord de mer et bénéficiant d'une myriade de commodités pour les enfants et les adultes, de même, y compris les piscines en bord de mer, parc aquatique rivière paresseuse et l'état de la salle de fitness de l'art, ce complexe est la destination parfaite pour vos prochaines vacances à la plage. Enfants rêves, une maison dans le parc aquatique. Deux Master Suites offrent identiques lits king size. Fin unité de coin avec balcon extra large. Superbe décoration Top Notch. Beautiful condo. Owner was very responsive and prompt to address any issues. The condo is more than advertised. Ms.Burbage is a gem to deal with and we enjoyed not only the view but the convenience with this gorgeous venue. Everything about the SPLASH was top notch and the parking was also great. Our plans are to be back next year in September for an even longer respite. Best place to stay! Loved it! We’ve been coming to Panama City Beach for more than 20 years and this was the nicest place we have stayed. The condo is roomy and very nicely decorated. Ellen is great at handling any problems that may come up. There is less traffic and quieter at this end of the beach. Yet Close to Pier Park and shopping. There is a Winn Dixie down the road. We will definitely rent from Ellen Again. Very well maintained. Nice layout, great floor for views. Great communication with owner. No issues. Most units in late summer are beat up from the business season, not this one. Beautiful condo, emaclately kept, great view, stocked with all appliances and extras. Want to rent with every stay in PC. Best ever!!! Owner is very nice. Ellen`s condo has always exceeded our expectations. very clean and had so many extra touches that made our stay fabulous, beautifully decorated and the kitchen was super, equipped with everything we need for our winter stay. Ellen was always available and quick to respond if we had questions. Beds were very comfortable and the bedrooms are super spacious....we have definitely found our home away from home. It has the best view as it is on the east side and you can have breakfast with the sunrise and dinner with the sunset and the sunset on the bay is the best anywhere. Love that the property is right on the beach. just get off the elevator on ground floor and voila the beach! The services are perfect, fast WiFi, HD TV and a phone service with Long Distance included. Take all these things into consideration and you will understand why we have returned over the years. Restaurants abound, grocery stores within walking distance and only a short drive to Pier Park. Panama City Beach has been our winter destination for over 10 Years now. Rates are subject to change until your reservation is confirmed. Stays of less than 7 nights pay a clean fee of $120.00. Taxes are included in all rates except monthly. Monthly, please add 12.6%. 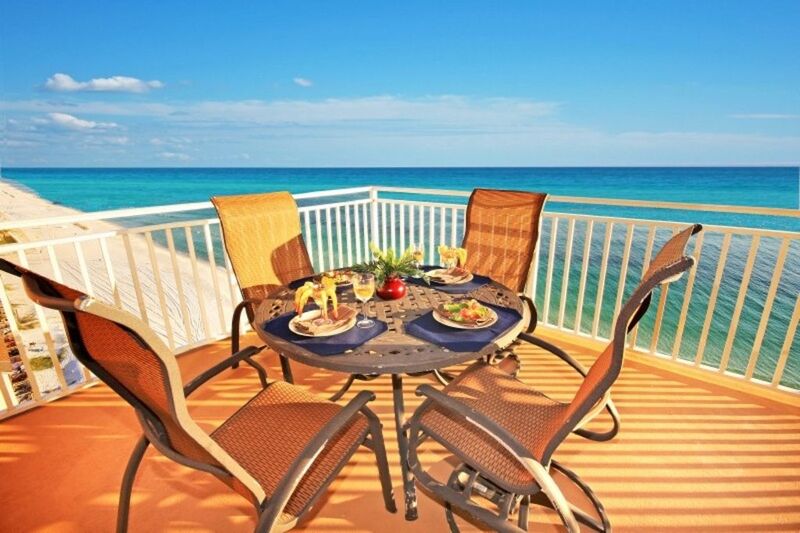 All guests, March 1st to October 31st, receive complementary beach chair service for two.